Here at the League, our efficacy is wholly dependent on the support of our members. Simply put, the more members we have, the louder our collective voice in DC becomes. Together, let's stand up for bicycling in these changing times in Washington. We need your help! Last year, we mobilized more than 12,000 individuals to contact the Federal Highway Administration and urge them to consider people, not just cars, in roadway performance measures. AND WE WON! Still, there's so much more we can do! We're working directly with thousands of cities, towns, businesses and universities to help them enhance bicycling in their communities. Bicycle Friendly America is way bigger than a ranking, we're giving them the tools and resources to turn next steps into lasting change. Members see great benefits and discounts at every level, from Bicycling Magazine to PoCampo, Raleigh and Diamondback Bikes, BikeFlights and a steep members-only deal on admission to the National Bike Summit. Our membership campaign is the lifeblood of our work. Please consider joining us in membership today and add your voice as a supporter of all things bicycling. For more than 120 years, the League has used it's unique reach as a national powerhouse to advance bicycling across the states. The League trains and insures local instructors, works with elected officials and stakeholders to create more bike lanes and trails, and advocates for pro-cycling policies on Capitol Hill. Together with our 18,000 members, we have the muscle to get things done! Don't wait for someone else to take a stand. We need YOU! 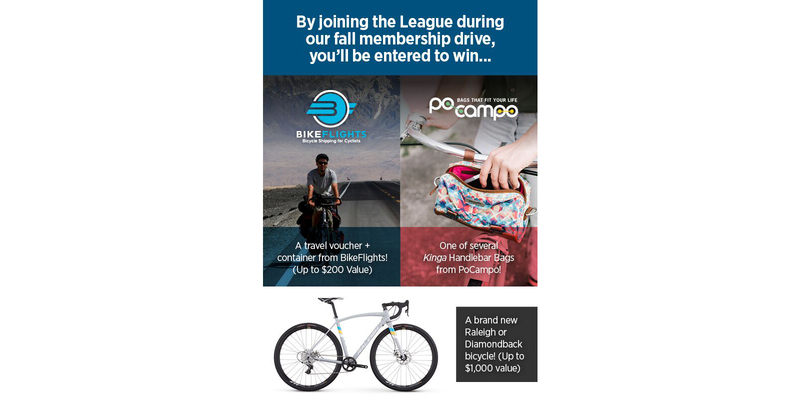 Our Membership Drive closes October 27th, and with it, your chance to win a new bike, travel vouchers, or bike bags. We can't wait to hear from you! Not sure if you're a member? Visit www.bikeleague.org/renew and enter your information to find out.